We don’t have good metaphors to help us understand the short selling of equities. It’s easy to understand a straight “long” investment. For example, planting a garden is a reasonable analogy—it involves buying seeds, planting them, and in due time there is a payoff—or not. But in real life people rarely borrow something, immediately sell it, and hope to buy it back at a cheaper price. Since we aren’t familiar with selling short many of its characteristics are counterintuitive. Below I’ve listed some common questions and answers—hopefully, they’ll make short selling a little easier to understand. Can I short securities in my IRA? No. IRS rules prevent borrowing within an IRA account—this rules out borrowing stock, the first step in a short sale. Buying inverse exchange-traded funds like SDS and SVXY is usually allowed, but your broker may require some extra paperwork. For more on IRAs see “15 Questions About Trading in an IRA”. What happens if I’m short a security when it goes ex-dividend? You owe the dividend. Your broker will deduct the dividend amount from your account on the distribution date. For more on dividends see “10 Questions About Dividends”. My short sale won’t go through because my broker says shares aren’t available to borrow. What should I do? Call your broker. Sometimes shares are available to borrow if you are willing to pay an additional fee—which can be relatively small (e.g., 7% per year). Consider using options instead, being long puts can give you a chance to profit if the security drops—with a fixed limited risk if you’re wrong. Unfortunately, options have expiration dates, a premium price, and sensitivity to volatility levels. If you have approval to sell naked calls you can create a synthetic short (long puts, short calls at the same strike price) that closely models a short position. Talk to other brokers. Some specialize in meeting the needs of short sellers. Look to see if there are equivalent inverse exchange-traded funds or notes available. See below for a discussion on inverse funds. 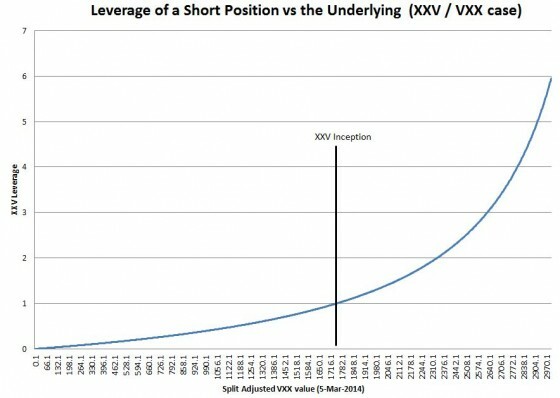 What is a short squeeze? Should I worry about it? A short squeeze can occur if the security has a relatively restricted supply of shares. If shareowners are holding tight (e.g., enjoying a recent run-up in the stock), then short sellers can get into a desperate situation with each other— bidding up the price of the stock trying to close out their positions and stem their losses. If you are thinking of shorting a stock, you should check the float, a measure of share availability, and the short interest. ShortSqueeze.com is an example website that provides that information. What does it mean that the shares I borrow can be recalled at any time? In a standard short selling arrangement, the loaner of the shares you borrowed can recall their shares at any point—for example, they might want to sell out their position. In practice this is rare, and the solution is straightforward—buy shares on the market to close out your position. Your broker will then return the shares to the lender. At that point. you can re-enter the position if you want to. When you sell short your broker will require you to have extra funds set aside in your margin account in case your short sale position starts losing money. Your broker will require that you always have enough funds in your account to close out your position. A margin call is a notification that you either need to add cash to your account, or cover some of your short position to reduce your exposure. If you don’t act, your broker will reduce your short position by buying back some of the security. What are the trade-offs between short selling and buying a resetting inverse exchange-traded fund/note (ETF/ETN) on the same security? No path dependency—the value of an inverse fund is dependent on how it gets to a certain value. For example big up and down moves, even if they cancel out will erode the value of an inverse fund. This can be a big deal. Constant leverage, the daily percentage moves will closely track the opposite percentage moves of the underlying security. Most inverse funds will rebalance daily to keep their leverage consistent. Potential gains greater than 100%. The resetting process of these funds enables them to avoid the 100% gain limitation of a short sale. For example, ProShare’s -1X SVXY increased from a split-adjusted $5 per share to $130 in late 2017 (and then crashed to $9 on February 5th, 2018). Your maximum loss is limited to your initial investment. With short positions your losses can be much larger than your initial position. How do you measure the returns on a short sale? For a regular long investment we use the initial cash outlay as our basis, and we divide the final result by that basis (and subtract one) to get percentage returns. However, in a short sale there is no initial cash outlay, no investment with which to compute the ROI. (1000-1100)/1000 = -0.1 A 10% loss. What is the maximum percentage gain possible on a short sale? (Initial Cash flow + 0) / Initial Cash flow = 1 A 100% gain. Barclays’ XXV fund (terminated August 2017) was essentially a true short (not a rebalanced inverse fund) of VXX that was initiated July 16th, 2010. As of March 2014, VXX had decreased a factor 40 since that date (split-adjusted 1751 to 43.24), but XXV had increased less than a factor of 2—from 20 to 38.42. 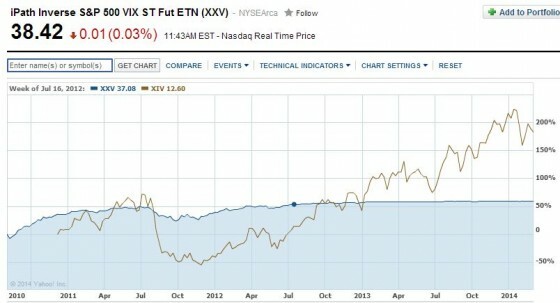 The chart below compares XXV’s performance to XIV, an inverse, daily resetting ETN. What’s the leverage of a short sale position? For a standard long position, the leverage is always one; if the stock goes up 10% your position goes up 10% in value. 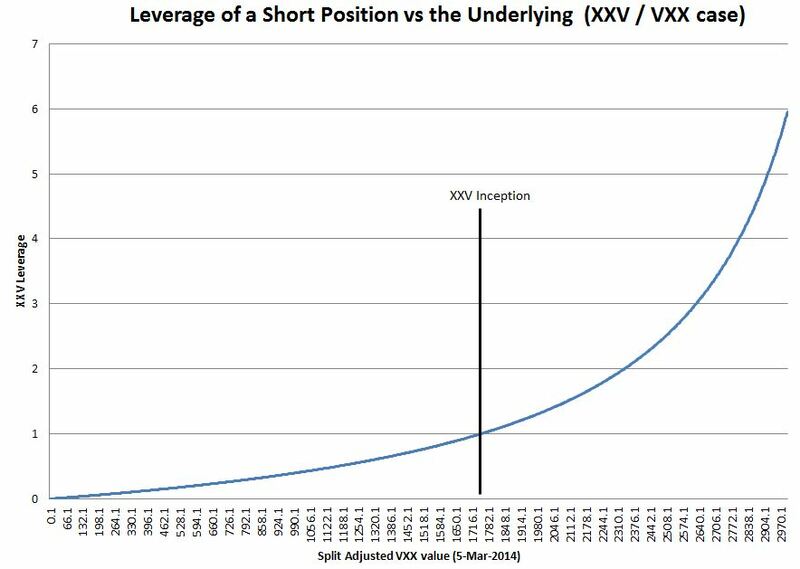 For a short position the leverage is variable, ranging from near zero to very high. At initiation, a short position has a leverage factor of one, but that leverage changes as soon as the price of the security changes—and not in the short seller’s favor. If the security increases in value above your sale point the leverage increases above one, below it drops under one.